Happy Wednesday everyone! I hope your week is going great-it seems to be going so slow, but moving along fast too, if that makes ANY sense at all. 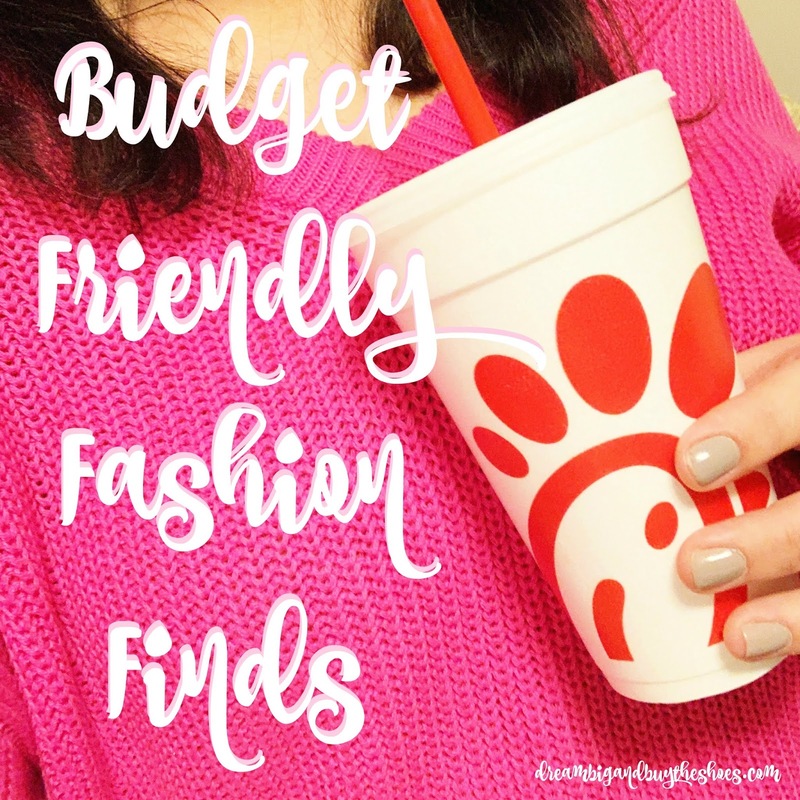 Today I wanted to share some budget friendly fashion finds that I am loving lately. I am a huge fan of comfort, cute and good deals so all of these items are under $25 and a great deal! There are affiliate links in this post, thanks so much for supporting Dream Big and Buy the Shoes! Time and Tru ponte pants- can you even believe that these are from Wal-Mart?! I have received a ton of compliments on them at work, and they are insanely comfortable. Can't rave about them enough. Gap Favorite long sleeve tee- these are a go to favorite of mine- been wearing them for years. They are great for layering or pairing up with jeans and a cute scarf. They feel like butter! A New Day fitted tee- just as good as the Gap ones, but even more of a variety of colors and usually more discounted in the Target app! Leather mules- Target does it again, always! I have the version of these from last year, and I can't say enough good things about them. Gucci knock-offs, super cozy and I could wear them for hours on end. Target luxe sweater- I picked this up on Black Friday for $10- it's only $15 right now. I'm debating getting a few more colors. Great with leggings- it's a long style which is perfect for styling and layering. Time and Tru chenille sweater- Another Wal-Mart steal, I really can't believe it! I found this when I took a random adventure on a Saturday night for office supplies and ice cream ;) The deals will always find you! BP v-neck sweater- I had my eye on this for a while and had it in my cart when I got a notification that it went on sale and I couldn't resist. I scooped up the pink because I don't have anything this color for Winter in my wardrobe. I'm in looooove! Nordstrom reversible scarf- I love when you can wear something simple multiple ways for great looks. This scarf is a must have for this season! leopard print scarf- A great purchase I made last year in a slightly different pattern. This would make a great gift for any leopard lover on your Christmas list. It's nice and lightweight enough to wear in the warmer seasons, but long enough you can wrap it up for warmth this Winter. gold hoop earring set- A good twist on a basic piece is always a great idea. I love these hoops and how fun they are and when a set comes with different sizes. What budget friendly items have you found lately?